The extensive Leader's Guide is an 8 1/2 x 11" 100-page pdf file that can be printed over and over for various leaders in your church. And, for each class session, individual Student Books (also in pdf files) can be printed either in their standard 5 1/2 x 8 1/2" size or as 8 1/2 x 11" sheets. And, Student Books can be copied from the CD Rom and sent to individual students a chapter at a time if you wish. 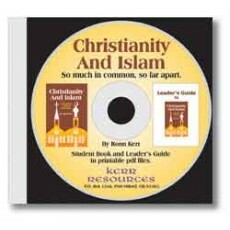 In addition to the Leader's Guide and Student Books, the Christianity and Islam course also has a new resource -- 359 PowerPoint Teaching Frames in thirteen Powerpoint shows plus a 56-page PowerPoint Guidebook. See below for links to these resources.